Builders Surplus is the TJMAXX of building supplies, meaning we offer the same high quality brands as the big box stores, but at a much more affordable price. We are renovation and remodeling experts that are passionate about helping you increase the value of your most important asset – your home or business. Not only do we supply the products you need, but we strive to make the process as easy and painless as possible. We specialize in complete kitchen and bathroom renovations, offering a wide variety of in-stock items as well as a huge range of special-order options, and our “special” surplus items. Surplus items could come in at any time, in potentially limited quantities, so when they’re gone, they’re gone! We promote these “specials” on social media and in our customer newsletter, so connect with us and sign up today! Over the last 69 years, Barber Cabinet Company has become a leader in the cabinet industry throughout Central Kentucky becoming the largest custom manufacturer in the state. Founded in 1948 by P.S. Barber Jr., Barber Cabinet is still 100% family owned and operated. The combination of experience and superior quality, makes a Barber cabinet easily recognizable. Plumbing, Lighting, and Cabinetry Showroom to meet every budget and design inspiration. For over 85 years, Plumbers Supply Co. has stood proud as the region’s ultimate supply and service source in the plumbing, heating and piping industry. In 1928, John Werst Sr. co-founded the first of what have become five separate divisions, 10 branch offices, and a main warehouse facility boasting 50,000 different products at a value of more then $20,000,000. The showrooms display a wide array of the latest innovations from the industry’s leading manufacturers, including Kohler, Delta, Moen, Brizo, Grohe, Hans Grohe, Robert Altman, Danze and others. The Plumbers Supply Co. Promise “Everything Under the Sun” -- To make available to our customers the most complete line of products and services in our industry at each of our branch locations. “Most Knowledgeable and Dependable Staff in the Business” -- To provide knowledgeable outside sales people along with inside sales and service support personnel to maximize the performance of our products and services “Your time is Money” -- To maintain the most efficient truck delivery service in the industry. “Trust In Us” -- To market our services and all 50,000 high quality products at the Fairest possible price. 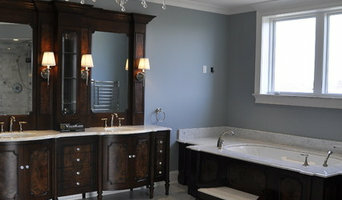 We hand make kitchen cabinets ,bathroom vanity, doors and millwork. 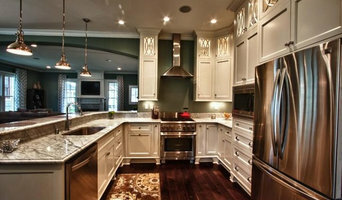 Mike's Woodworking Inc. has been crafting exceptional cabinets for over 25 years. We specialize in designing, building, and installing custom cabinetry kitchens, baths, and entertainment centers. Welcome to A & R Quality Cabinets.We are a family owned business that Ron Rich started in 1988 in Louisville, Kentucky in my home.We now have a showroom @ 2960 Richland Avenue in Louisville, Ky. with a warehouse downtown.Presently we sell 3 lines of distributor cabinets Blue River Cabinetry, Haas Cabinets, and Showplace Wood Products along with plastic laminate, granite,quartz, and solid surface countertops. ABM was founded in 1978 and serves demanding clients nationwide through its headquarters and manufacturing facilities in Louisville, Kentucky. The company is an award winning manufacturer of MasterCast cultured marble and granite products. These products are designed with durability, non-porous/sanitary and low maintenance considerations in mind. 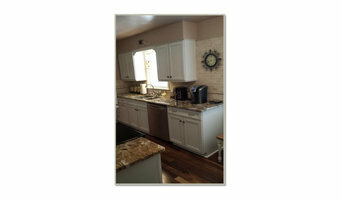 We specialize in Kitchen and Countertop installation for New Homes. 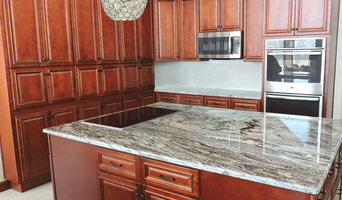 As one of the region’s largest suppliers of kitchen cabinets and granite countertops, we can help stabilize your flow of product to create a manageable, accurate, dependable delivery program. That saves you time, money and headaches. The building industry’s construction professionals count on Sims-Lohman to be on time, every time. Kitchens and bathrooms are the most renovated rooms in any Louisville home. Storage is a top concern in these rooms, so hiring Louisville, KY professionals to create and install custom cabinets in your home can be key to expanding your spaces and controlling clutter. Use the Houzz Professionals listings to find Louisville, KY kitchen and bath accessory vendors. Don’t rule out asking a kitchen manufacturer’s design team for help, too. Skills often can be overlapped to save you time and money! Here are some related professionals and vendors to complement the work of kitchen & bath fixtures: Kitchen & Bath Designers, Kitchen & Bath Remodelers, Interior Designers & Decorators, Cabinets & Cabinetry. Find kitchen and bath fixtures and accessories, plus installation experts, on Houzz. Check out Kentucky kitchen products and installers, and bath plumbing products and installers, on Houzz. You can also look through project photos provided by Louisville, KY renovators, retailers and designers.